Not overly sweet, this recipe is a grapefruit-lover's delight. 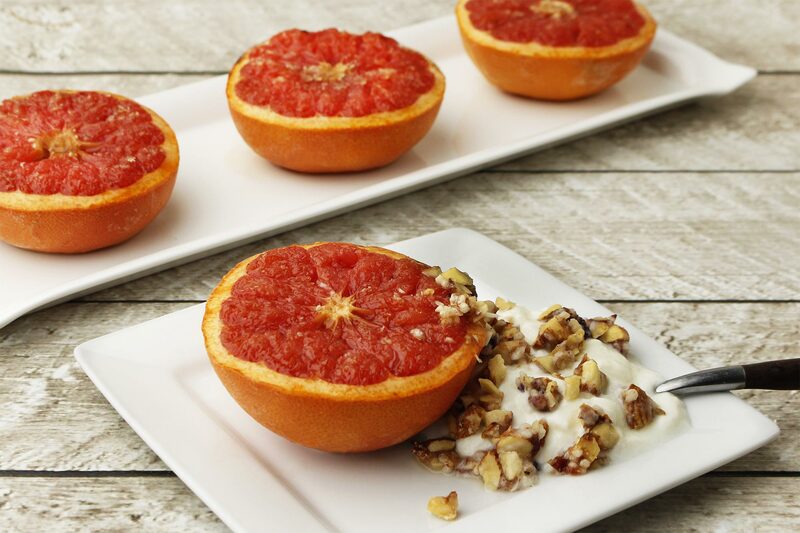 The warm grapefruit pairs well with the cold, honey-sweetened yogurt and adding crunchy granola or nuts makes for a more substantial breakfast or healthy snack. Start by laying your grapefruit on its side and slicing it right down the middle. Slice a thin slice off the bottom peel of each half to make sure they don’t wiggle. Place the grapefruit halves face-down on paper towels for about five minutes to absorb excess moisture. In a small bowl, mix together the raw sugar, ginger and cinnamon and a dash of salt. On a baking sheet, place the grapefruit halves face up. Sprinkle each half with even amounts of the sugar mixture. Broil for 7 to 10 minutes, until the sugar is melted and slightly caramelized. Let the grapefruit halves cool for at least a few minutes; serve warm or at room temperature with Greek yogurt (swirl in honey if you'd like) and granola, dried fruit and nuts.